Zubits magnetic shoe closures are the latest and easiest shoe device which makes your shoes insanely easy to take on and off. These magnetic closures are so strong that they can hold sufficient pressure and you can use them anywhere including gym and sports activities. Never tie laces again! Just simplify your shoes with these high tech magnetic closures and forget about tying knots, loose laces, falling down, floppy bows etc. Available in various colors and sizes, Zubits are suitable for most of all types of men shoes. 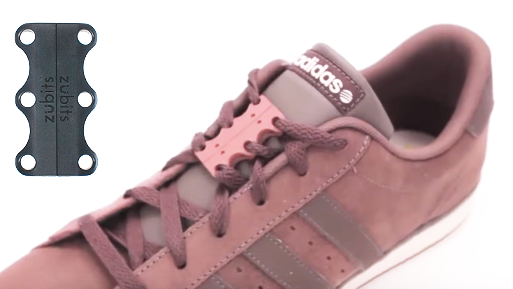 Zubits magnetic closures make our life so easy that you don't even have to tie and open your laces again. Just clean looking shoes without ugly floppy bows sometimes we see. With these strong magnets, you can even stick them to any metal objects like cupboard, rods or any metallic day to day objects. Be aware of those fake magnetic shoe closures as they may hurt you by accident getting opened up at workplaces. Make sure you buy original Zubits closures from genuine online stores.